If the answer is YES, then you need closed-captioning (CC). This blog post is continuing the topic of 'accessibility'. First let's start with a definition. Closed captioning is the text that appears synchronously along with a video that captures spoken words and sounds that occur in the video. Closed captioning typically will appear below the video on a black background and the user has the ability to toggle the captioning on and off. It is important to note that subtitles are different from closed captioning. Subtitles are for foreign languages and intended for HEARING people. Closed captioning is designed specifically for NON-hearing people and those who are hard of hearing. If you are using videos that are publicly posted on the internet and if it does not provide closed captioning it is important that you do not require a student to view the video as it is not accessible and does not meet ADA compliance. Try to find video resources that include captions. Sometimes you can contact the publisher/author and make arrangements to obtain a version of the video that includes captions. I recently attended the "14th Annual Accessing Higher Ground, Accessible Media, Web and Technology Conference" that is sponsored each year by CU Boulder. It was very informative and I plan on sharing a few posts on this blog that address some of the tips and best practices that I learned about. Some of the topics I focused on are: captioning videos (best practices and how to do it), tips on Adobe Connect, Acrobat and Captivate for accessibility, strategies for implementing a campus wide policy, and best practices for accessible graphics/images. This year's Sloan-C conference had close to 1,500 attending in person and another 600 virtually. Impressive. The conference was well organized and had two outstanding keynote speakers. Here's a summary of some of the better sessions I attended. John Rogate, Champlain College, U.S.
Second Life costs $3,540 per year and recently rescinded the academic discount. The session discussed a free alternative called OpenSim that is based on an earlier version of the Second Life development engine. OpenSim has undergone several versions and is currently a stable environment. The co-presenter was a former Second Life designer from the Netherlands. She may be a good resource for information on development of the nursing sim at Regis. Alexandra Pickett from SUNY also provided information on the Second Life Medical Center used at SUNY. The workshop was more of a rant against Second Life than a session for learning about virtual worlds. I had hoped for more practical information on the use of virtual worlds for medical sims. John Sener distributed a worksheet titled Sixteen Propositions about the Future of Online Education. He mentioned the 10% annual growth rate in online education and the importance of cybersymbiosis, where we will be fundamentally dependent on online and other digital technologies. Online education will soon be an integral part of the educational world and disappear as it becomes part of the everyday classroom. He points out the danger of cyberdystopia, where big business takes over online education and devalues human interaction. Great food for thought. Wednesday's keynote was presented by Lee Rainie, director of the Pew Internet and American Life Project. Pew research studies are closely watched for their insights into American usage of computers and the internet. Lee began his talk by mentioning "tweckling", which is heckling the speaker with disparaging tweets. Funny stuff! Some of the latest research by Pew (Pew is someones name rather than an acronym) indicates that 95% of 12-17 yera olds uses broadband, as well as 41% of those 65 and older. He also mentioned the importance of analytics for making sense of "big data" and information from multiple sources. Analytics helps sort these data into understandable and usable chunks. Lee continued by saying that over half of those using social networking are over 35 years old. Older users use social networks to cope with life such as discussing life changing events. Also, Facebook is used to reunite long-lost friends such as high school classmates. Social networks provide a method of determining relevance of information while providing an audience. Some of the most interesting data came from mobile technologies. 85% of teens take their phones to bed with them. And there are 327 million wireless subscriptions to accommodate the United States population of 315 million. These data point to some interesting possibilities. For example, users are becoming more adept at real-time and just-in-time sharing of information. Users are becoming better searchers of information rather than remembering more information. This is leading to a new kind of learner, a learner more reliant on feedback and response, one who is more inclined to collaborate, and a learner more oriented towards being a node of production rather than a sole source. Thursdays keynote was presented by Cable Green, director of Global Learning at Creative Commons. He began his talk by mentioning that the worlds knowledge is a public good. He mentioned several educational resources such as Saylor.org (free education), OCW Consortium (free course content), the Capetown Declaration, and SPARC (open access to scholarly research). Other resources for sharable content include MERLOT, Connexions and OER. A movement is underway at several universities to use sharable content. For example, Athabasca requires faculty to globally search for course content before creating new courses. There are a number of virtual environments currently available. Some of these include Active Worlds, Second Life, Meta Place, and OpenSim. Businesses began developing heavily in virtual worlds but have been retreating at a rapid rate. The presenters suggested starting small and building as necessary rather than initially purchasing large plots of land. The presenters then demonstrated a virtual environment created several years ago that was similar to other virtual environments. The environment was developed using the Unity development engine. They also mentioned ReactionGrid, a virtual world development company. Howard plugged his new book titled A New Culture of Learning. He mentioned how the questions asked by students are more important than the answers they provide. Social media are very important to students in the classroom. Blogs are read by all students and provide an individual voice as well as a source of reflection. Howard mentioned the importance of "crap detection", or sifting the bad information from the good. One example he used was the web advertisement for the "online pregnancy test." Although obviously tongue-in-cheek, similar results could be interpreted as authentic by the more gullible. Another example was a supposed tribute to Dr. Martin Luther King. However, the deeper one got into the site the more inflammatory the text. Howard dug more deeply into the site author and determined that he was a white supremacist with a subversive message. Know your information sources! Big Blue Button: free open source web conferencing. easywhois: find out the owner of a website (free). An excellent session detailing a project to bring course content to mobile devices. The project included PC, iPad, iPhones, and Androids. They suggested to not attempt to duplicate PC functions on a smart phone. Rather, develop content around the key features of phones. They started with a student survey asking what students wanted and expected from mobile technology. Mobile features were integrated into standard courses rather than being stand-alone. One of the most innovative session topics was provided by Barbara Berg, nursing faculty at RHCHP. Barbara presented a poster session detailing an innovative use of video feedback for student assignments. Barbara used a free video platform to record video feedback which was then attached to an email and sent back to students. The feedback format was well accepted by students. 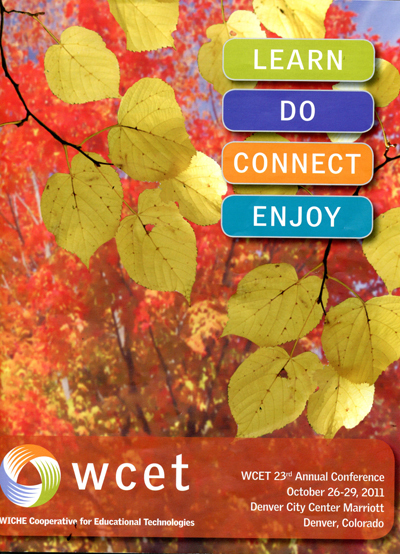 This past week was the 2011 WCET annual conference, held at the Denver City Center Marriott. This was my first WCET conference since 2004 when I presented on plagiarism detection services. Time certainly does fly! A great retention method from HeadMagnet (http://headmagnet.com/). Rob Robinson, David Cillay and Chris Manriquez gave their perspectives in an interactive panel discussion on the changing roles of today's learning technology leaders. They emphasized the critical need to sift through the ever-expanding amounts of data to find the information needed to make sound decisions. This is the only way for new initiatives to get off the drawing board. They also talked about the importance of the hybrid model and the conversion of seat-based courses to hybrid. Not only does this provide economies of scale for classroom space but places course materials online for greater access. Ritchie Boyd, Julie Kelleher and Loyce Pailen represented the WCET LMS CIG. The panel facilitated discussion on the academic technology ecosystem and the expanding role of 3rd party products. Many of the technologies being adopted by faculty are not necessarily formally supported by IT departments. Apps such as Dropbox, YouTube, and Google Docs are preferred by faculty for their ease of use, simplicity, availability and collaborative potential. IT departments are concerned with their long term availability and the potential security issues. Future online CIG discussions will expand on these issues. Perhaps the highlight of sessions was one presented by colleagues at CPS Learning Design. Dr. Ling Thompson, Sally Cordrey and Jane Johnson presented on their award-winning Passport to Course Development. The three discussed the development of their multi-media course on course development for faculty. The behind-the-scenes look demonstrated the highly talented staff working at Learning Design. The course won the 2011 WCET Outstanding Work (WOW) award for "innovative, technology-based solutions to a significant problem or need in higher education." A much-deserved recognition. My overall thoughts on the conference were that it was all right. I didn’t learn as much as I was hoping for, I was expecting the breakout sessions to be more detailed. I came away with a few things to check out and explore as well as some contacts. I attended a session on Kaltura that I enjoyed and received good information. The University of Wisconsin has been using Kaltura for the past several months at their campus. They have also adopted Media Space which allows instructors and students to upload videos. The overall feedback from students and instructors is that they loved it, it played well, but they didn’t like being forced to use the embed code. The other session I attended was Showcase Desire2Learn Training to get feedback on D2L from instructors and students. This session was presented from multiple different schools including Prairie state college, University of Wisconsin, and Colorado Community College System. Students and instructors would like to see email on their Blackberry. The tools students use the most are content, grades, Dropbox and Discussions. The tools instructors use the most are content, grades, email, Dropbox and News item. The least effective tool for both instructors and students are chat, locker, and the checklist. Majority of the students don’t know what the locker is and never used it. When students would send chats to other students, they didn’t notice they received a chat. It was helpful to receive information from Instructors and students as we approach our training. I am happy I was able to come away with some contacts that will be useful for Kaltura. I attended several great sessions at the D2L Fusion meeting held in Denver. My two favorite, however, were the ones on Using Social Media to Enhance Online Courses and Academic Analytics. Using Social Media focused on using this method to connect to that group of students that are used to texting, tweeting and using facebook to send reminders to students about upcoming due dates, brief feedback comments and other short quips the instructor needs to communicate. The best way to use Facebook was not to “friend” students but to create a Fan Page for the course and post announcements and any other pertinent information there. That way you are not intruding on the student’s social life! Attending the Desire2Learn conference, Fusion 2011, was a great insite into the D2L culture. The presenters were very knowledgeable and presented great insight into using the D2L LMS efficiently to maximize the teaching and learning options of the end users. I picked up a lot of great suggestions to apply to the migration to D2L and contacts for future projects once the university is up and running with the LMS as current D2L users are more than happy to share with others in the community. Two very interesting topics that will have great impact on Regis in the future is the work that D2L software designers are doing in the area mobile computing. The goal is to make working in D2L for students, faculty, and staff possible from multiple mobile device platforms. The intent is not limited to picking up messages or reviewing information to then work with on laptops or desktops, but rather to fully use the mobile device for development and deployment of assignments, course projects, course content, and other learning tasks and objects. The second exciting discovery has to do Adobe Connect. D2L used to have a partnership with Elluminate as its featured web conferencing tool. After competitor Blackboard bought Elluminate, D2L has been working with Adobe to create the same partnership for Connect. In development is a widget, similar to a Nugget in WorldClass, which will give anytime access to an instructor’s meeting room to allow students the opportunity to have synchronous meetings and to practice with the software. Since Regis already has a Connect Enterprise license, this partnership will enhance Connect usage. It was a bit overwhelming to go straight into a conference prior to being up and running. Not knowing exactly what to ask and what would be most helpful made for a few uncertainties, but in the end information gained was immediately applicable. Based on my attendance at the D2L Fusion Conference, there appears to be many add-ons to the D2L system that are available for a fee. While each of these add-ons (lecture capture through Capture, Connect Yard social media, etc), a cost/benefit analysis needs to be done on purchasing such add-ons. The lecture capture on the surface appears to be an appealing and beneficial add-on but a more in-depth examination is warranted. From the sessions I attended, it appeared that many sessions were provided on the add-ons and fewer sessions on the general use of the basic D2L learning management system. It was definitely a marketing tool for expanding D2L use. Conference sessions of how to use the Intelligent Agents built into the D2L system were intriguing and having this power in D2L has the potential of being very beneficial for a faculty and students alike. Intelligent Agents can be thought of as “the eyes at the back of your head” and can be set-up to automatically send out positive reinforcement and reminders to students. Faculty can set the parameters such that if students do not read the syllabus, an email is automatically sent to those students with a reminder to read the syllabus. The dropbox parameters can be developed so that an email is automatically sent to students who have not submitted an assignment by a certain date. Email reminders can be automatically sent to students who have not accessed the course for a set number of days. These are just a few examples of the use of Intelligent Agents. Faculty develop if…then……statements to set the release condition for unleashing the power of the Intelligent Agent features. There can be automatic, active, and passive release conditions set. Faculty can control access to course components, release remediation and enrichment, news items, personalize discussions as part of the Intelligent Agent options. Faculty can become a member of the D2L Community and then will have access to release condition best practices and examples. As a faculty member who uses the “first post” option in Worldclass, I was disappointed that D2L does not have such a feature. When the “first post” option is set in a Worldclass discussion, students are not able to see the other students’ posts until they make their first post to the discussion. One way to do this in D2L is to have the students copy and paste their first post in the dropbox where a release conditions has been set (there is that Intelligent Agent again). Once the student submits the posting in the dropbox, based on the release condition, the student will then be able to see the posts in the discussion forum. The student then copy and pastes the post—the same post as made in the dropbox, to the discussion forum. While it requires the students to go through an extra step, it is probably the best method for doing a “first post” in D2L.